The WGLR was built at the turn of the 19th - 20th Century on the border of England (Shropshire) and Wales (Montgomeryshire) as a means of connecting the agricultural areas around the towns of Gooey and Cockshutt Mortimer with the Cambrian Railway at Wetton. In addition, the WGLR was linked to the Montgomery Canal at Gooey via a tramway. It was this agricultural area that generated most of the line's traffic. Coal, livestock, fertiliser, farm machinery and animal food accounting for much of the freight receipts. Passenger services were also provided, particularly popular on market days. In the 1920's the Royal Air Force established a Maintenance Unit (41 MU) at Ffynon Garew and the extra traffic generated by this facility (together with a nearby timber mill) kept the railway open when it's traditional traffic was enivitably lost to road transport. 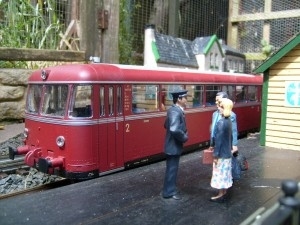 In fact the railway was as busy as ever during the 1940's as the WGLR played it's part in the war effort. ............. Thankfully the volunteers who had earlier saved the Talyllyn Railway had shown what could be done and a similar body of volunteers set about preserving the WGLR. Some stock had been lost, but much was saved and the line was restored to use in stages until it was once again fully open. Passenger levels soon rose to a level unheard of in the railway's pre-preservation era and bigger, more powerful locomotives were required to haul longer passenger trains. Much of this rolling stock was imported from Europe. Today the WGLR is a thriving concern, not only carrying thousands of passengers every year, but also generating new forms of "green" traffic such as serving the recently re-opened timber mill. 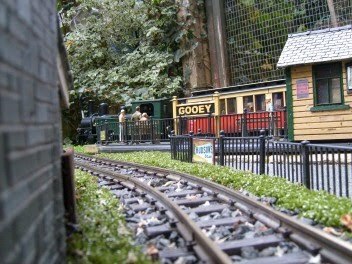 In reality our garden railway was started at the end of 2006 with an LGB passenger train starter set (as so many have) plus some extra track. Our garden is not particularly large and in order to fit in a reasonable amount of track, all curves are radius one. 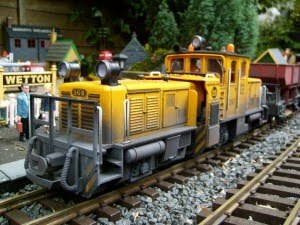 Train control is analogue using the Aristocraft Train Engineer. Most of the locos and rolling stock is LGB, although I also have locos from Bachmann and Piko together with many of Accucraft's excellent British outline goods wagons and kit built stock from IP Engineering. Buildings are a mixture of scratch built, kits from T & M, Model Town and Pendlebury, and ready made concrete items from the Tuxcraft range. Several real railways have provided inspiration for the WGLR including the Welshpool & Llanfair (especially the town section) and the Cleobury Mortimer & Ditton Priors Light Railway (standard gauge) which ran very close to where I live. 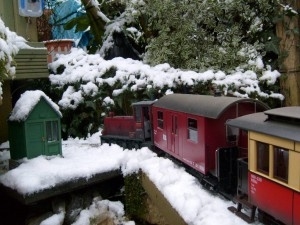 We have big plans for improvements in the garden this year which will result in much of the railway having to be re-built. However, this will free up more room and the railway is likely to be extended. 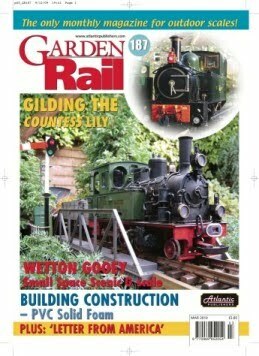 The WGLR is featured in the March 2010 edition of Garden Rail magazine. Tag has very kindly given me permission to post the finished article on this site. Subpages (5): A lap of the WGLR Cloddfa Pedr (Peter's Quarry) People of the Wetton valley Wetton Gooey Light Railway - the 2010 re-build What a load of druids! !